The Stanford Marsh Group incorporating Cadspec are very delighted to announce UK & Ireland dealer status for the new range of HP Pagewide XL Large Format Printer Range - One of only 2 mainland UK resellers. HP Pagewide represents the most significant step forward in Wide Format Printing Technology since the launch of the first affordable Digital Black & White Plan Printer in 1989. This exciting technology radically changes the wide-format printer market with benchmark Speed & Cost of Ownership. With completly new architecture this range of devices moves current technical, GIS & Graphic wide-format colour output from at best 4 A1 per Minute print speed to a super sonic speed at a maximum of 30 A1 per minute underlining the significance of this exciting new range. Utilising Pigment based ink ensuring a fade resistance and on certain medias moisture resistance this product portfolio stands out from any other device on the market. The HP Pagewide XL 8000 can be pre-ordered from Stanford Marsh immediately with customer demonstrations avialble from June (on an advance booking basis only). The XL 8000 is the Flag Ship product and first to market with optional six rolls on-line, choice of integrated folder or stacker, optional HD Scanner and with standard output speed of up to 30 A1 PPM with an overall print width of 40" if desired. The fastest large-format printer ever, monochrome and colour. HP PageWide XL 5000 Printer series offers two variants with four rolls online, a printer only version and an MFP variant with Scan and Scan to copy functions. This device will be launched early 2016 & we will begin processing orders late 2015. 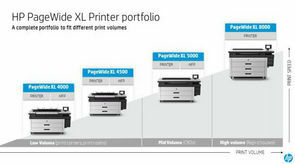 HP Pagewide XL 4000 Printer Series offers four variations, with upto 4 media rolls online. The XL 4500 offers output speeds of 12 A1 per minute and the XL 4000 offers 8 A1 per minute both models come in standard printer configuartion or as an MFP, in all Print only cases and HP HD scanner can be added if desired. Launch will again be during 2016.